Journeys Beyond the Cosmodrome is an expanded film project with photographs, video and stories that was created with teenagers aging out of Kazakhstan’s Akkol Bolshoi orphanage into challenging and uncertain futures. Download the exhibition catalog for Journeys Beyond the Cosmodrome, Tengri Umai Gallery, Almaty, Kazakhstan. The Akkol orphanage is situated next to the satellite field that communicates with rockets launched from Kazakhstan’s Cosmodrome and fly overhead towards the International Space Station. Over two summers, sixteen teenagers participated in writing, video and photographic workshops led by Lydia Matthews and Jeanne C. Finley. We engaged students to imagine, through images and stories, their journeys upon graduating from the orphanage. 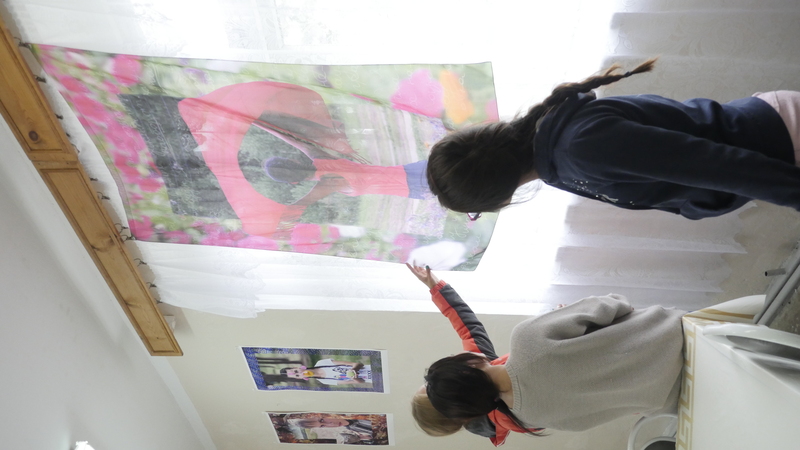 Using scientific and fictional images of space travel as a metaphor, the group discussed their dreams, articulated potential challenges, and identified what aspects of Kazakh folk culture they would take with them into their new universe. 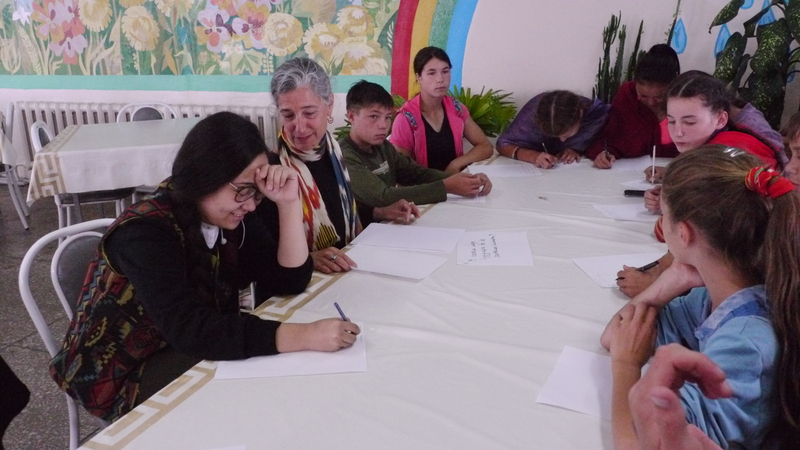 By interweaving ideas from space exploration, traditional Kazakh literature, global popular culture, and their own personal desires and interests we challenged the students to write about the skills that will empower them as they enter Kazakh society with little or no support. The students then playfully performed their imagined future selves, collaboratively staging photographic self-portraits with simple objects found at the orphanage such as a rock, a cell phone or a scarf, that captured the stories they had begun to write. The teen’s optimism is situated from the perspective of a troubled past that sees a future realized only if first imagined. 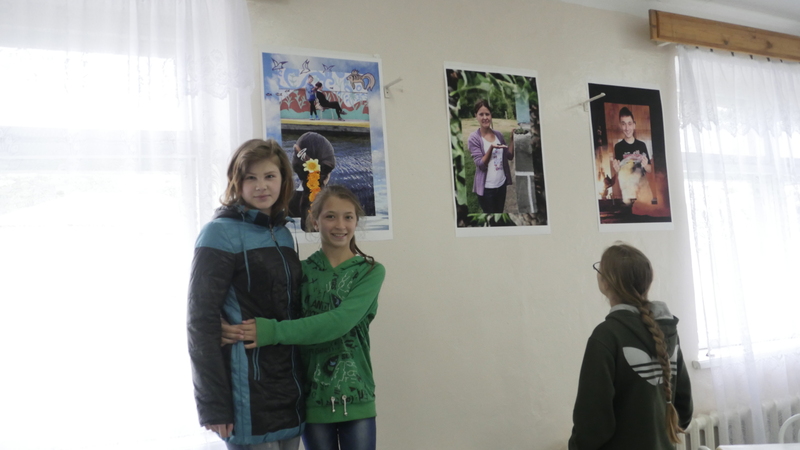 After working with the portraits and stories, Finley brought the work back to the teens in the form of a book and exhibition that was held at the orphanage and at the Tengri Umai Gallery in Almaty Kazakhstan. We continued to work with the original group of students and engaged more students in creating new images, narratives, and video performances. In December, a live video/performance of three of the teens’ narratives will be presented with Kim Anno and other artists at the Oakland Asian Cultural Center Theater. This expanded film performance will include original songs written by Kri Schlafer from the kids writing and performed live by the Threshold Choir, multiple video projections, the self-portraits and sound. This live event will be streamed live to the orphanage so they can respond during the event via social media. Journeys Beyond the Cosmodrome has been supported by a CEC Artslink Fellowship, a California College of the Arts Development Grant, and the Motherless Child Foundation. The workshops were conducted with Lydia Matthews and Jeanne C. Finley, with invaluable assistance and translation from Lyazzat Khanim. The photographs and stories were produced with the creative assistance of Tamara Porras.